Nothing says holiday beauty faster than juicy, smooth, plump lips -- with a dash of sparkle. 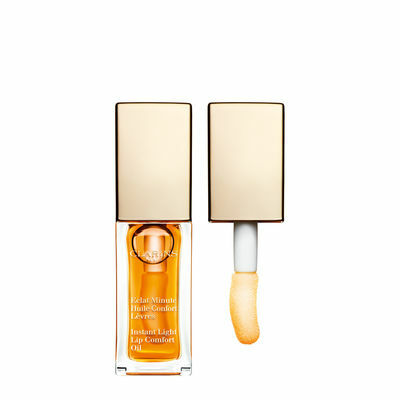 Enter Clarins’ Instant Light Lip Comfort Oil 07 in Honey Glam ($26) to enhance and nourish your kisser and add on that twinkly French je ne sais quoi. The formula combines the high shine of a gloss with the soothing comfort of un-greasy organic jojoba and hazelnut oils, and un-sticky, microscopic, honey-based golden flecks that turn your lips into two deliciously desirable ornaments of love. Wear it three ways: as a conditioner to prep lips for lipstick, on its own for a kind-of-natural glimmer, or over lipstick for that extra pop of come-kiss-moi.